In 2008, Eben Alexander came down with acute bacterial meningitis and was in deep coma for 6 days, with little chance for survival. Although his brain was severely compromised, he had a profound, ultra-real experience of an exquisite, heavenly realm. High above him shimmering angelic beings arced across the sky in glorious song, raising him higher and higher. He entered an immense void. A Journey to Heaven and Back is the theme of a symposium on near-death experiences by the Open Center in New York City, Saturday, November 23. The program will include NDErs Dr. Eben Alexander, Anita Moorjani and Lorna Byrne, and will be moderated by NDE researcher Robert Mays. The panelists in this symposium have all had NDEs and have demonstrated great courage in sharing their stories in the face of great skepticism, but feel compelled to bring hope and comfort to others by sharing their profound conviction that there is nothing to fear when we transition to the next life. Come hear their remarkable accounts and explore the implications of these extraordinary experiences. Also WBAI-FM interview about the Symposium (35 min). The 8th Annual Spiritual Retreat for NDErs will be held at the Mercy Center in Saint Louis, May 16 through 19, conducted by near-death experiencers. "As near-death experiencers we’ve been coming together every year since 2006 in St. Louis, MO for three consecutive days of opening our hearts and sharing our journeys, both on the other side and through our lives here on earth.... We have found that coming together to share with one another, opening our hearts to each other and voicing what has been a soul-altering experience allows us to not only make sense of our lives but also creates a community of support that strengthens and grows each time we meet." The retreat brochure and retreat agenda. Pictures from prior retreats. To register for the retreat, click here. The sign-up for the retreat closes on April 27 at midnight. Imagine a day when near-death experiencers can talk to their healthcare professionals about their NDEs and receive not judgment or ridicule, but support. We need YOUR help to make that day come sooner, rather than later. 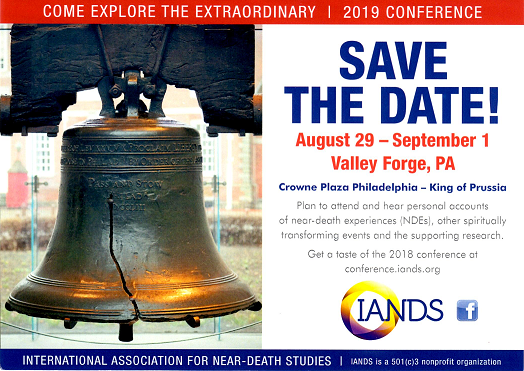 IANDS has now completed a state-of-the-art project that should have a tremendous impact on thousands of counselors, psychologists, nurses, social workers and other professionals about near-death experiences. Each year, these professionals are required to further their education by taking classes that have been accredited through their professional associations. Our former President, Dr. Jan Holden took a sabbatical leave to develop just such a course. Part one of the course is now available on this website, using topnotch media production facilities and technology. The online courses with CEU/CME credit can not only educate an unlimited number of healthcare professionals, it provides IANDS with a solid income stream. In order to support the development of the full set of courses, we need to raise enough money to get this course and the future courses online, accredited and the word out. The cost for that will be around $18,000. The entire IANDS board has already pitched in and contributed an average of $887.50 per board member or $7100. It is relying on its dedicated members and supporters to contribute the remaining $10,900. Please join us in making this vision a reality.